Each year, on the second Wednesday in March, we celebrate National Registered Dietitian and Nutritionist Day. This occasion celebrates the contributions of Dietitians and helps to raise awareness of the role RDs like me play in helping people enjoy a healthy life. At Kellogg, we have a team of Dietitians who support our brands and lead on our Nutrition Activation Team. I am one of Kellogg’s Registered Dietitians (RDs) and support Special K’s Girl Up activation. In my role, I have a unique opportunity to help create meaningful connections between girls and food. As one of the RDs responsible for Special K, I have the unique opportunity to help the brand as it invests in the health education of adolescent girls, and its partnership with the United Nations Foundation’s Girl Up program. I am responsible for creating recipes and developing a nutrition education module for 500,000 girls. We provide this information online for girls, and encourage them to use the information at their local Girl Up clubs. We develop this information to help guide girls toward healthier choices. When girls are educated and healthy, they often feel safe and empowered. And when they do, they can transform their communities in every corner of the world. That’s what Girl Up is all about – it’s a movement within the United Nations Foundation, led by girls, for girls, empowering them to take action in areas where, frankly, it’s tough to be a girl. I became a Dietitian because I am passionate about helping people learn how their food choices affect their body. Last summer, I had the opportunity to share this passion with more than 350 teen girls from 11 countries at the Girl Up Leadership Summit. At the conference, I facilitated train-the-trainer sessions using lesson plans I developed featuring Special K recipes and nutrition information. As a RD, I was proud to guide these recipes from initial concept to final testing – and tasting! My favorite was our Peach Cobbler – a delicious and nutritious combo of Special K® Vanilla Almond Cereal with low-fat milk, peaches and a dash of cinnamon. Yum! 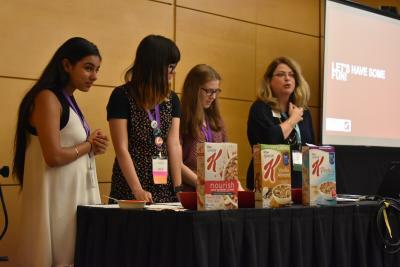 Together, girls and I made snacks using cereal, and shared ideas that the girl delegates could use at Girl Up clubs in their own communities. At Kellogg, we’re empowering girls with education and information on many of the factors they can control, such as nutrition, fitness, fostering a sense of community, and mental and emotional well-being. In 2017, we provided nutrition education to more than half a million girls around the world. Our efforts helped girls empower other girls with the more confidence in food choices—and it’s why I became a Dietitian. Today, on National Registered Dietitian and Nutritionist Day, I’m reminded and feel fortunate that my role allows me the opportunity to help more girls can reach their maximum potential in all aspects of life.